Racing for the newly formed Irish EvoPro Racing team, who are making their debut for the 2019 season, Gate won the 132km stage in 3hr 0m 48secsonds in a sprint finish with St George Continental Cycling team’s Mathew Zenovich. Gate’s team mate, leading Dutch sprinter Wouter Wippert finished third 1min 02 secs later. Defending Tour champion Hayden McCormick (Team BridgeLane) crossed the line in seventh place overall while U23 rider Ethan Batt was the first New Zealand National team rider home. Gate, 28, said he was super stoked to take the stage win following a hard day in the saddle. 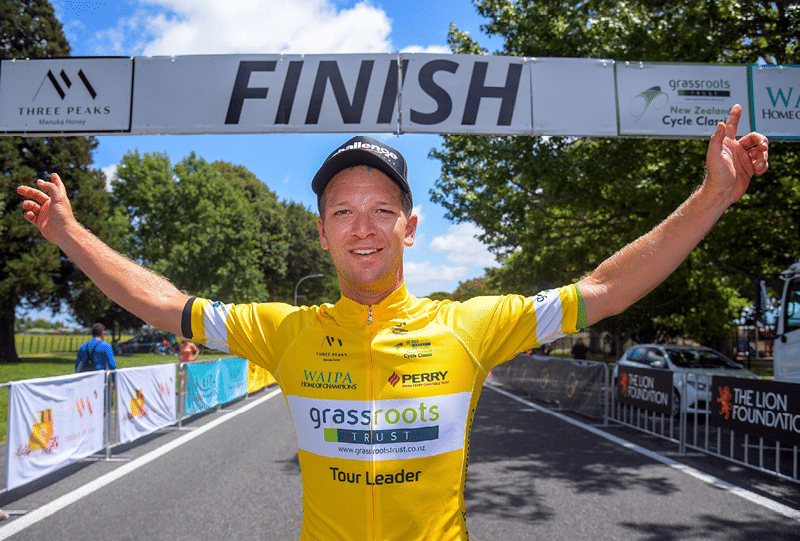 Along with Zenovich and Drapac Cannondale’s Liam Magennis, the trio formed a breakaway about 30km into the Lost Lake Loop (Cambridge – Kaipaki – Roto o rangi – Leamington). At one point, the trio extended that lead to five minutes, before Magennis dropped off the front at the 100km mark. Battling windy conditions and a chasing peleton, Gate and Zenovich worked hard together out in front to maintain their lead, however Gate gave it his all with 100m to go and took the win.